How annoying is it when you give your phone to your friend to see one picture, and they start swiping left to view more. In these moments you start questioning your privacy. For teenagers, this is a major topic of debate at home with their parents, and they often find themselves quarrelling for the same reasons. Here’s how to hide files on Android phone. Here is a shout out to all of you dealing with such frustrating events in life, maintain some peace in your demeanour as there is a solution to every problem. 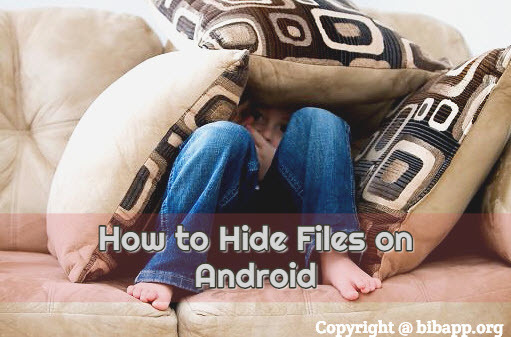 All you have to do is follow a few simple steps to hide all the image files on your Android device. Yes, you read right. Now you can make it a secret on your phone and not have to shed beads of sweat worrying about who is checking your phone and what you have to hide. Follow this post to hide important files on Android mobile. The easiest option is to download a file locker app. There are many like Keep Safe, Hide it Pro, Vault, Gallery Lock, Photovault. Creating a pin after installing the app is the next step. You can also set a recovery address if you have forgotten the PIN. You can then add images to this app that you have installed. You can also download a file management app found on Google Play Store like- ES file Explorer, File Manager, ASTRO file manager. You then select the pictures and shift it to the folder you want to hide it in. After that, you create a new folder and put a period at the beginning fo the folder name. You then change settings to enable viewing of hidden files. After this, you open the new folder and create a new file where you move the pictures that you want to keep a secret. Hide these files, and add the photos to the folder. You are now ready to go. That’s all. With the above technique, you can hide videos, images and other important files on your Android. Share this word with your friends and don’t forget to comment your ideas.